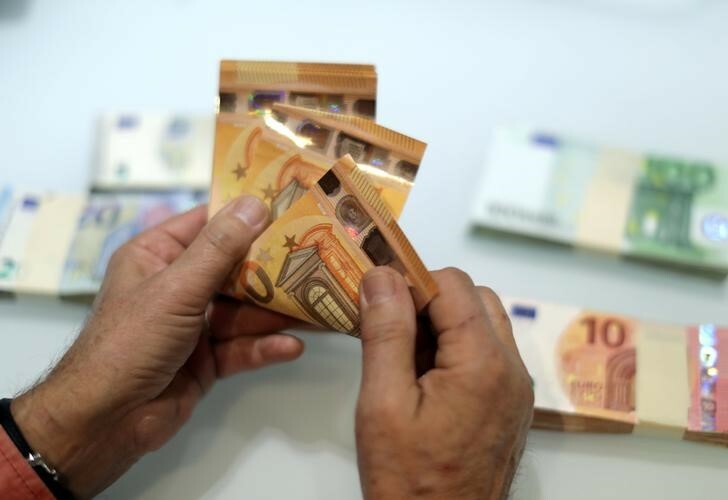 LONDON (Reuters) – The euro climbed to a three-week high on Thursday as investors raised their bets that the European Central Bank will next week signal a winding down of its vast bond-buying program by the end of this year. The central bank’s chief economist Peter Praet, a close ally of President Mario Draghi, said on Wednesday that the ECB would debate at its policy meeting next week whether to end bond purchases later this year. Jens Weidmann, the head of Germany’s central bank, said expectations the ECB would taper its bond-buying program by the end of this year were plausible while his Dutch counterpart, Klaas Knot, said there was no reason to continue a quantitative easing program. The comments drove the euro to $1.1838 (EUR=), up half a percent on the day and its highest since May 17. Some analysts have taken the comments to suggest a decision is coming at the June 14 meeting but others saw it as the starting gun in a debate that will likely culminate in a decision in July. Petr Krpata, currencies strategist at ING, said the most “realistically bullish” case was for the ECB to signal a one quarter extension of the bond-buying to end-December. “If they say only one more quarter, that’s the biggest upside potential for the euro,” he said, adding that he was less bullish and expected the ECB to make the unwinding more open-ended and conditional on economic news. He said the euro’s strength was limited given concerns about a trade war that could hit big euro zone exporters, and the possibility of a more hawkish Federal Reserve when it meets next week and is expected to raise interest rates for the second time this year. Many market players were surprised by the flurry of ECB comments as they had thought uncertainty caused by a political crisis in Italy would stay policymakers’ hands. Euro zone inflation will also need to stay close to the ECB’s target for several months before policy is tightened, analysts said. “Our economists remain highly sceptical about the development of (core) inflation in the euro zone,” Commerzbank (DE:CBKG) analysts wrote, describing some “normalization fantasies” as “too high-flying”. In emerging markets, the Turkish lira was the big mover of the day. The lira surged more than three percent to below 4.47 lira against the dollar after the central bank hiked the benchmark interest rate by 125 basis points, more than expected. The dollar index (DXY) slipped 0.4 percent to its weakest since May 17, helping currencies including sterling claw back some of their recent losses. Despite the improving mood among investors on Thursday many remain cautious, especially ahead of a summit this weekend of the Group of Seven leaders when President Donald Trump looks set to clash with his counterparts over trade. After a six-week long rapid rally the dollar has failed to break above key levels against some of its rivals, raising concerns the greenback’s weakness may have more room to run. Against the yen , for example, it has failed to break above a 200 day moving average, potentially opening the door for more losses before a key G7 meeting this weekend. The dollar fell 0.2 percent to 109.98 yen. The Australian dollar dipped 0.2 percent against the dollar to $0.7652 , off a 1-1/2-month high touched on Wednesday, boosted in part by the country’s strong economic data.